Blazing Hot Wok: What Do You Feed a Sick Child? What Do You Feed a Sick Child? At 4:30 last night Sonny crawled into bed with us. Ten minutes later, he threw up...on me. Miraculously, Hubby and his side of the bed were spared. After cleaning up, Sonny and I moved to his bed, where he proceeded to throw up about 10 more times. Luckily I had the foresight to put an empty bucket next to the bed and luckily we were able to contain everything in that bucket. Finally at 6:30 we gave up trying to sleep and turned on cartoons. He didn’t throw up again. But he didn’t really eat anything substantial all day, just crackers and toast. What do you feed a child who seems to have a stomach bug (or any other ailment for that matter)? If you asked my mom, she’d probably say her cure-all hot and sour soup. But my own motherly instincts tell me hot and sour soup is not going to help Sonny’s stomach. I decided to make a milder rice soup instead. When people think of an Asian-style rice soup, something like jook usually comes to mind. I love jook...the porridge texture with bits of shredded fried pork on top and dotted with chili-garlic oil, but Sonny won’t touch it because of the texture (did I mention he’s picky??). 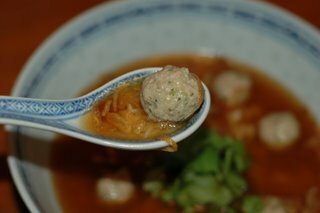 He prefers a soupier version with firm grains of rice and mini meatballs. Don’t forget the meatballs or the world might end. Mix all the ingredients together and form into small balls. If you end up with more mixture than you need to use immediately, just freeze some of it (before cooking) for later use. I recommend poaching the meatballs in a separate pot from the broth, otherwise your wonderfully rich, clear broth will become cloudy. If this doesn't bother you, then by all means, poach them in the soup broth. If I'm feeling industrious, I will poach them then give them a quick saute to brown the outsides. Use a good broth for the soup. This goes without saying. The broth should be rich enough that if you don’t want to add any sauces or garnishes, it will still taste great. Starting with a bland broth will result in a bland soup, no matter what sauces or garnishes you add. If you want to chance the world ending, you can use any other protein you like. Diced leftover roasted chicken, tofu, or a poached egg work well. I’ve even used leftover stir-fry from a previous meal (see picture below). It gives the soup some extra flavor. To keep the rice firm, I use cold leftover rice. I don't even bother to reheat. The grains will warm through when you ladle the hot broth on top. 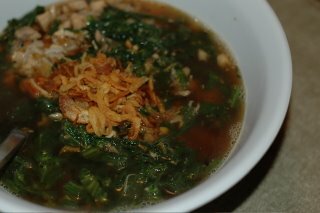 Rice soup with chicken and stir-fried mustard greens. It's very strange. He threw up water once more the next morning (Friday), but has been fine ever since.